METI is a career college providing certified Occupational, Environmental, Health and Safety training for today’s industries… coast to coast. We provide occupational, environmental, health and safety training through our accredited and industry-approved programs and courses. 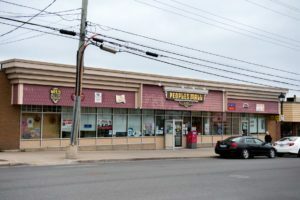 We are a registered Private Career College with Nova Scotia Department of Labour & Advanced Education. METI is a licensed Driver Training School in accordance with the Motor Vehicle Act offering programs of study in Environmental Health & Safety Technician Diploma Program, Class 1 Driver Training, Class 3 Driver Training, and Class 5, Scaffold Erector, Earthmoving, and Oilfield And Construction Skilled Labourer as well as Safety Courses, Safety Services, in-demand online training and are a franchisee for YOUNG DRIVERS of Canada. METI is proud to say that in 2019 we are working with over 500 businesses and organizations, providing instructor-led occupational safety training, coast to coast. METI makes a strong effort to continue working with students after graduation so they can secure employment. We are passionate about graduating students with a real world education to help students get and hold jobs. Our team is made up of industry-experienced faculty, instructors, and staff. 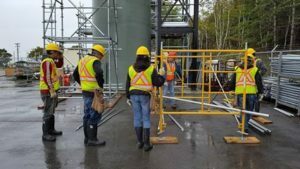 METI’s training is geared to provide students with the knowledge, skills and certification needed to meet the requirements of a person employed in a variety of industries; whether as EHS Technicians, EHS Supervisors, EHS Consultants, EHS Advisors, Supervisors, Foremen, Hazardous Waste Supervisors, Class 1 or Class 3 Operators, Scaffolders, Oilfield & Construction Skilled Labourers, Equipment Operators, Temporary Workplace Signers, Traffic Control Persons, Confined Space Attendants, Fire Watchers, Bottle Watch Attendants, Confined Space Entrants and Attendants, Hazardous Waste Workers, Lead, Asbestos or Mold Abatement Persons, and much, much more. Continued development and enhancement are top priorities for METI, and we continue to strive to provide the best training experience to our students and clients. Since incorporation in 1991, METI purchased Hatscan Online, an online training venture which has provided training for over 70,000 users and over 500 businesses. In addition to the global reach of our online training, METI has delivered instructor-led training across Canada and in locales such as Scotland and Bangladesh. Along with providing classroom-based training, METI’s learning management system (LMS) administers and tracks training across 4 continents, allowing supervisors and managers to oversee training history and records with our Administration Control feature. 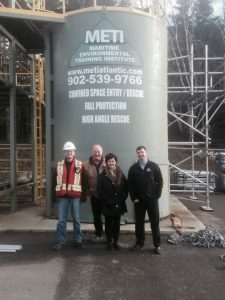 Since acquiring our new campus in 2012, METI’s Sydney, Nova Scotia location boasts a training facility, complete with two building units with over 22,000 square feet and a fully developed training yard. At METI, we maintain a friendly, fair, and creative learning environment which respects diversity, new ideas, and hard work, distinguishing us as a private career college. Growth and development are imperative to METI’s vision, and we strive to accomplish this by providing our students with quality, in demand, cost-effective safety training and certification. We facilitate our safety training by using equipment that includes late model Class 1, Class 3 and Class 5 Vehicles, Forklift, Scissor Lift, Backhoe, Excavator, Mini Excavator, Rough Terrain Telehandler – Zoom-Boom, Aerial Work Platform, Confined Space Training simulator, Tower Rescue Training and Fall Protection Training Simulators, Respiratory Protective Equipment and Gas Detection Training equipment, a Fire Safety Simulator, a Hazardous Waste Supervisor Training simulator and Hazardous Waster Worker Training simulator, Asbestos Abatement Training simulator and Mold Remediation Training simulation areas, Underground Storage Tank Removal Training – UST Training Area, along with Frame Scaffold Training, Systems Scaffolds Training and Tube and Coupler (clamp) Scaffolds Training and much more. 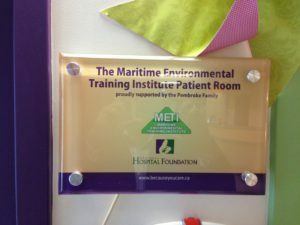 How Does METI Ensure Qualified And Endorsed Training? 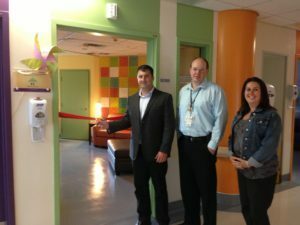 Joe Pembroke of Maritime Environmental Training Institute cuts the ribbon at the official opening of the Family Room in the Pediatric Unit at the Cape Breton Regional Hospital. It is with the support of the community that made this possible and we are proud to be able to give back. Thank you from the METI team. November, 2016 – METI staff welcomes Traci Curry, Suncor Turnaround, to a tour of our Sydney, NS facility. METI is very proud to be work have been recognized and to be partnered with Suncor Energy as a training provider for future turn-arounds.